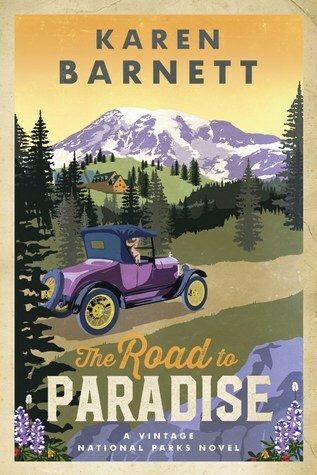 Today I am reviewing The Road to Paradise, a Vintage National Parks Novel by Karen Barnett. In 1927, Margie Lane, an avid naturalist, convinces her Senator father to procure her a position at the fledgling Mount Rainier National Park. Since Ranger Ford Brannon lost his father in a climbing accident, he doubts his ability to protect the park and its many visitors. He certainly doesn’t relish the job of watching over an idealistic and privileged young woman with no practical survival skills. I was excited to meet Karen Barnett at the Christian Fiction Readers Retreat this past August… and she graciously gifted me a book. When I offered to read and review her book, she autographed another book for a giveaway! If this book sounds interesting and you would like to win a copy, leave a comment… and you just might be the winner of a copy of The Road to Paradise: A Vintage National Parks Novel. Doesn’t that make you want to keep reading? I certainly did…and I did! This book is inspiring, with humor and colorful characters. Margaret Lane, the daughter of a U.S. Senator, and Chief Ranger Ford Brayden are indeed inspiring characters, as they fight to save the national park. I am glad you were able to meet Karen Barnett at the Christian Fiction Readers Retreat. I have read a few of her books and would love to read this one. Thanks for the opportunity to win a copy and good luck everyone. Would love to read this book. I appreciated the review. I would love to read this book. I read another book about Denali and it is fascinating. Thanks for the chance to win! What a wonderful approach for a book based in a national park. I would love to read this!